Miners have declared the industry has reached ‘peak gold’, with production likely to only decline in the future. New research by Thomson Reuters GFMS, published in the Financial Times, stated that production of gold globally will begin its decline, falling three per cent this year alone and capping close to a decade of rising output levels. Peak gold was predicted to occur last year, as falling prices made as many as 10 per cent of all gold operations uneconomical. Much of the decline is due to major producers such as China, Australia, Russia, and the US failing to fill the enormous gap left by sharply falling production rates out of South Africa. "2015 will be the peak in world gold production," Grant Thornton’s Brock Mackenzie told Australian Mining in an interview early last year. “So every year after that there will be less gold produced, which will have a positive effect on the price." 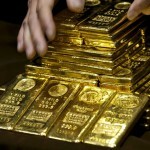 Goldman Sachs research echoed Mackenzie’s prediction, with a dire warning of only 20 years of known mineable reserves of gold left, adding that discoveries of new sources peaked in 1995. Polymetal CEO Vitaly Nesis was even more negative on future production predicting a supply contraction of between 15 to 20 per cent over the next three to four years. In the last five years gold has moved from a high of $1900.05 to fall more than 20 per cent to a low of $1053.03. Has the mining downturn hit rock bottom?